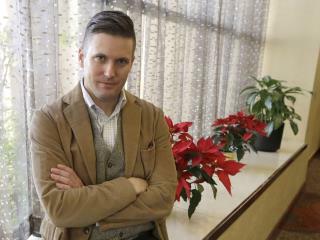 (Newser) – White nationalist Richard Spencer is scheduled to speak at the University of Florida on Thursday, and authorities are treating him like an approaching hurricane: Gov. Rick Scott has declared a state of emergency in Alachua County, which includes the Gainesville campus where Spencer will speak, the New York Daily News reports. Large protests are expected. In a statement, Scott says that "everyone has the right to voice their opinion," but "we have zero tolerance for violence, and public safety is always our No. 1 priority." University officials say they plan to spend $500,000 on security for the Spencer event, his first at a college since a University of Virginia rally the day before the Charlottesville violence. The Alt Right can run ...but they can't hide. Its hilarious that even with trump as president supporting them at every turn, its the worse time for them ever. The nazis are being dragged back to their closets. The Antifa thing is comical. If anything, the definition of facism is violently suppressing other ideologies, which is why FL is in a state of emergency, not because of the speaker himself. You are not heroes, there is no genocide or anything close. There is no Hitler, there are no Nazis (by definition), no holocaust, no ovens or concentration camps. Get out of your self-aggrandizing delusional state - you are not great warriors of freedom, you are intolerant, hypocritical morons pretending to be crusaders. You are like kids in a treehouse pretending to be pirates. Here's the thing I THOUGHT the left learned after Trump won the election - the more you smash windows and scream at people, the less the average person is to side with your ideology.